Pressure washing your home or commercial building is a common, effective approach to removing mold, dirt, dust or mildew to provide a thorough cleaning and enhance the overall appearance of your property. It is also an important first step when engaging in a painting process as well since it ensures a smoother finish when your painting home improvement project is completed. Pressure washing typically is performed with two types of water. The type of water used is dependent upon the surface itself. Hot water is used when your home or commercial building has a great deal of dirt, grease or oil on the surface. It is particularly good for concrete surfaces and for cleaning the grout between bricks. Done with specialized washers that heat up the water, whether electricity, kerosene or natural gas, hot water more often than not speeds up the overall cleaning process. Additionally, cold water is just as effective and used just as often. However, using cold water takes a good deal more time to complete the task. If your home is constructed with siding, then the use of cold water is ideal. Keep in mind that cold water is also less expensive because you have no additional costs for fuel. If you plan to embark on an exterior painting project, when you pressure wash the surface, it is much easier for the paint to adhere to the surface. If you attempt to paint without pressure washing, dirt and grime on the surface can create abundant problems especially in older homes. Pressure washing gets rid of any dirt, pollution, dust, chipped paint, mold and even chalky residue (oxidation from outside elements) that accumulates on your home’s exterior. The washing process typically requires scaffolding and can be quite dangerous if you have never used any type of pressure washer before. 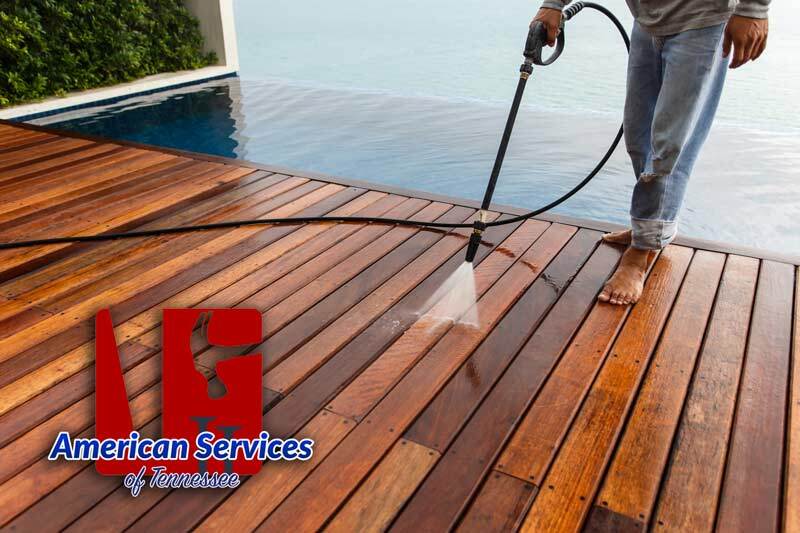 The folks here at American Renovations Services are all about the safety and well-being of our valued clients, which is why we want to share with you the potential dangers of attempting to use a pressure washer on your own. For starters, a pressure washer can cause grave harm to your bare skin if it comes in contact. When using a ladder, the ladder can actually be knocked over from the overall force of the washer causing you to fall backwards or have the ladder crash down on you. Further dangers include damaging the vinyl siding of your home and any wood fixtures if the water is too hot. Also, if the weather outside is somewhat cold and you are using hot water, you can actually crack the windows of your home or building. Finally, pressure washers are quite heavy and take a good deal of strength which means it can be quite a bit of a workout to successfully operate one, especially if your home or building is rather large. For all these reasons, we highly recommend you contact our professional team to handle all your pressure washing needs. Not only will our experts get your home improvement project done in a timely fashion for you, but they will accomplish the task with the highest level of accuracy and safety as well. We have the expertise and know how needed to identify problems and resolve them in advance and prevent any other problems from occurring. We save you a whole lot of trouble and frustration that could come into play if you are, in fact, inexperienced at using a pressure washer. Whether you are in need of residential or commercial pressure washing services rest assured we are the team for you. Using only state of the art tools and equipment, coupled with our skill and training, we get the job done right the first time and do so in a timely manner. Should you need to contract our professional painters to paint your exterior surfaces, we highly recommend you include a pressure wash of the exterior surfaces before we begin your residential or commercial painting project. Spring is finally here. What better time of year to start planning those home improvement projects. If pressure washing your home or commercial building is on your list of projects, then don’t wait a moment longer. Give a shout out to our friendly team of specialists today and schedule your free consultation. We look forward to serving you and to providing you with all your renovation and remodeling needs! !